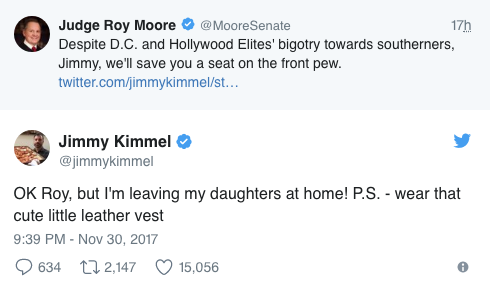 Jimmy Kimmel has taken down controversial Alabama senator Roy Moore with one of the most savage tweet-based tirades ever seen. The politician, who has been accused of sexual assault, faced off against the US TV host after Kimmel sent one of his 'correspondents' to disrupt a campaign rally. 'Jake Byrd' - actually a comedian called Tony Barbieri - went to the event at the Magnolia Springs Baptist Church and shouted down protesters of Roy Moore, saying he was a "man's man" and asking if "that was the face of a child molester" before being escorted out. Once Moore's campaign discovered the truth, the candidate did an interview for Breitbart blasting Kimmel and posted the link to his personal twitter page. 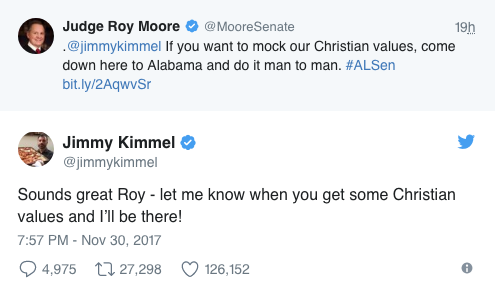 It was here that Kimmel himself personally responded, after Moore challenged him to mock his Christian values in person. Kimmel also referred to numerous allegations of inappropriate sexual conduct towards young girls leveled against the candidate. Footage of the event is due to be shown on Kimmel's show in the coming days.